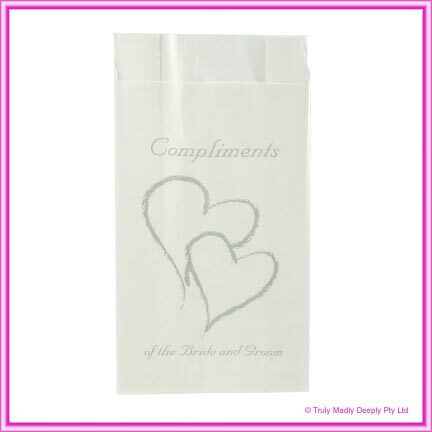 White wedding cake bags with twin silver hearts and "Compliments of the Bride & Groom". Bags are made from professional grease proof paper. Dimensions of 8cm wide by 15cm tall. Bags have a gusseted side for expansion/wider opening. Contains 100 Wedding Cake bags. Economical & very popular for guests to take their wedding cake home.